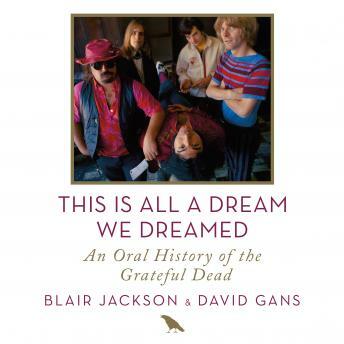 In This Is All a Dream We Dreamed, two of the most well-respected chroniclers of the Dead, Blair Jackson and David Gans, reveal the band's story through the words of its members, their creative collaborators and peers, and a number of diverse fans, stitching together a multitude of voices into a seamless oral tapestry. Capturing the ebullient spirit at the group's core, Jackson and Gans weave together a musical saga that examines the music and subculture that developed into its own economy, touching fans from all walks of life, from penniless hippies to celebrities, and at least one U.S. vice president. This definitive book traces the Dead's evolution from its humble beginnings as a folk/bluegrass band playing small venues in Palo Alto to the feral psychedelic warriors and stadium-filling Americana jam band that blazed all the way through to the 90s. Along the way, we hear from many who were touched by the Dead-from David Crosby and Miles Davis, to Ken Kesey, Carolyn "Mountain Girl" Garcia, and a host of Merry Pranksters, to legendary concert promoter Bill Graham, and others. Throughout their journey the Dead broke (and sometimes rewrote) just about every rule of the music business, defying conventional wisdom and charting their own often unusual course, in the process creating a business model unlike any seen before. Musically, too, they were pioneers, fusing inspired ideas and techniques with intuition and fearlessness to craft an utterly unique and instantly recognizable sound. Their music centered on collective improvisation, spiritual and social democracy, trust, generosity, and fun. They believed that you can make something real, spontaneous, and compelling happen with other musicians if you trust and encourage each other, and jam as if your life depended on it. And when it worked, there was nothing else like it. Whether you're part of the new generation of Deadheads who are just discovering their music or a devoted fan who has traded Dead tapes for decades, you will want to listen in on the irresistible conversations and anecdotes shared in these pages. You'll hear stories you haven't heard before, possibly from voices that may be unfamiliar to you, and the tales that unfold will shed a whole new light on a long and inspiring musical odyssey. Includes archival recordings of Grateful Dead band members and fans.